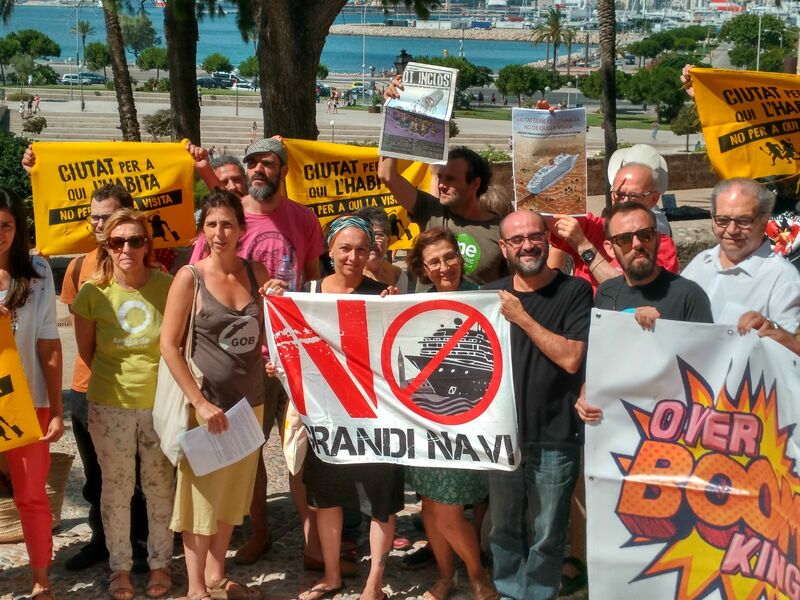 Amics de la Terra, Comitato No Grandi Navi de Venècia, Assemblea de Barris per un Turisme Sostenible, Entre Barris de València, Morar em Lisboa, Ciutat per qui l’habita and GOB have come together in Palma to speak out against the impact of mass tourism and its saturation of towns and regions, and the intensification of cruise-ship tourism in Mediterranean ports. On Saturday 1 July 2017, we met up in Palma in front of the port to specifically address the effects of cruise-ship tourism and how it affects the social and economic reality of the city and the island, and that society is not invited to take part in the debate. Palma is turning into a city set for tourists arriving here on cruises. In fact, this type of tourism adds to that of tourists staying in residences in Palma (via family home holiday rentals advertised illegally) and to that of those tourists who want to visit the city, arriving via the airport and staying in hotels or other parts of the island. All of this affects not just the city’s tourism model, but also the model of the city itself, people living together, the commercial reality (shops providing basic necessities – bakeries, butchers, greengrocers and so on – disappear to make way for ice-cream and gift shops) and the availability of public spaces that are always invaded for economic activities linked to city tourism (walkways and squares cease to be for the people who live there and become invaded by shops, bars and restaurants who put out their products and tables). Who’s asked us if that’s what we wanted? Venice has a serious problem with canal erosion and pollution, and the saturation of the city as a result of cruise-ship tourism along the canals. The group Comitato No Grandi Navi uses direct action to avoid this type of damaging tourism within the framework of a city where tourists invade every corner. Barcelona has also protested on various occasions against cruise-ship tourism because of the huge effects on the city: city pollution, saturation and collapse derived from the mass arrival of cruises at a port that’s become a reference port for international cruise ships. The arrival of the mega cruise ships (the ‘giants of the sea’), seen as a tourism activity on the rise, have, in reality, a scarce economic impact on the ports they visit. These cruise ships are owned by societies established in tax havens and with a flag of convenience, as with the oil tankers such as the Prestige. Great Britain dominates this sector. The result is that the cruise ships are a sort of tax and labour haven, as reported by the ITF (International Transport Workers’ Federation). These ships have a capacity varying between 2-4,000 places and can be as large as 7,000. These floating cities stay, on average, just 1.49 days. The cruise-ship tourism model is usually an all-inclusive service. Cruise tourists spend an average of 55.52 EUR a day in the Balearic Islands (source: INESTUR). Cruise ships must be considered floating cities, which generate waste and need natural resources, dumped and provided respectively in Mallorca (source: OCEANA). This is what happens to the water and the rubbish, which we must treat with Balearic public money at installations that we have to support all year round. Mega cruise ships increase the demand on these products, ruining plan forecasts (for example, the Water Plan). In what way do mega cruise ships repay these services? In the case of large polluters, a principle should be established that whoever contaminates, pays. Mega cruise ships are floating cities without social nor political control. With all this in mind, it seems to be a very unworthwhile business from a social perspective. Organisations speak out about the lack of information on the impacts and say ENOUGH!